Nancy Smith is an acupuncturist whose medical experience spans 34 years as a Physician Assistant (P.A.) prior to studying acupuncture and becoming a Licensed Acupuncturist as of 2017. She has served as a clinical Physician Assistant at Johns Hopkins Hospital while coordinating research for clinical trials. Nancy graduated from Maryland University of Integrative Health in 2017 with her Masters degree in Acupuncture. Her passion is treating Pain Management, Anxiety, and Neuromuscular conditions. She was trained in 5 Element style acupuncture and she is National Acupuncture Detox Association (NADA) certified. Due to Nancy’s medical background, she is well-poised to collaborate care with your medical providers, especially regarding difficult cases. Nancy also has a Master of Public Health degree in International Health Communications and has had several editorial positions at several Baltimore-area hospitals, the Hopkins School of Public Health, a USAID project, and the US Naval Institute. 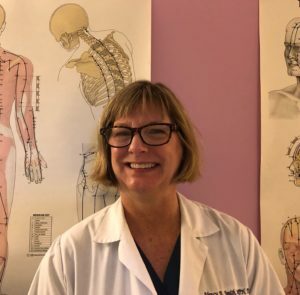 When not doing acupuncture, Nancy loves to read and loves spending time at the beach with her daughter Alli and her rescue dog and cat, Jackie and Popeye. Nancy is a participating provider with Blue Cross/Blue Shield, Cigna, Aetna, and Johns Hopkins EHP.